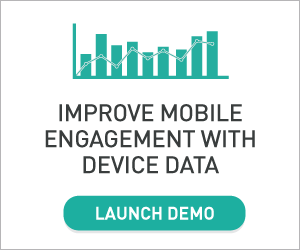 Today’s devices pack in a vast array of sensors that gather data about the device and the world around it. For web applications, access to these sensors has grown over time through the addition to the browser of various sensor APIs such as the Geolocation API, and the DeviceOrientation Events API. Such APIs have been instrumental in evolving the web platform to feature-parity with native apps, while at the same time still offering all the advantages the web has over native. In this article we take a look at a new API for device sensors: the Generic Sensor API. Why do we need a new sensor API? Since we already have APIs to access sensor data in the browser, you might be wondering why we need a new API. The existing sensor APIs have little in common, especially considering that, broadly, they offer similar types of functionality: reading sensor data, and doing something with that data. The goal of the Generic Sensor API is to promote consistency across sensor APIs, enable advanced use cases thanks to performant low-level APIs, and increase the pace at which new sensors can be exposed to the Web by simplifying the specification and implementation processes. The Generic Sensor API achieves this by defining a set of interfaces that expose sensors, consisting of the base Sensor interface, and concrete sensor classes that extend this, making it easy to add new sensors, and providing a consistent way to use them. An interesting aspect of the API is Fusion sensors. You can think of these as virtual sensors that combine or fuse the data of multiple real sensors into a new sensor that is reliable and robust, or that has filtered and combined the data in such as way that is appropriate for a certain goal. We’ll see the benefit of this later when we first build a simple compass app using the Magnetometer sensor directly, and then see how we can improve this based on the AbsoluteOrientationSensor, a fusion sensor which combines data from real magnetometer, accelerometer, and gyroscope sensors. The API has specifications for a number of sensors, such as Accelerometer, Ambient Light Sensor, Magnetometer, Gyroscope, OrientationSensor as well as drafts for future sensors, such as Geolocation Sensor and Proximity Sensor. Edge and Firefox have partial implementations of the AmbientLightSensor, and Firefox has an open issue to implement the Generic Sensor API, but there is no ETA on this yet. Support for individual sensor implementations are listed separately on caniuse.com. W3C invites implementations of the Sensor APIs here. Let’s run through a couple of examples. Before we begin, note that this API can only be used on secure (HTTPS) contexts. You get the idea. We could do the same for any of the sensors listed earlier. //Fallback, do something else etc. Maximum allowed frequency value for this sensor type is 10 Hz. What kind of security concerns might there be around the ambient light sensor? Reflected ambient light levels from a device’s screen can be exploited to determine pixel values of the screen. Limiting the sampling frequency can mitigate threats like this. This pattern will be repeated for all the sensors we use in the following sections. There are actually three sensors defined in the Accelerometer spec: Accelerometer, LinearAccelerationSensor, and GravitySensor. Each of them provides some information about the accelerations applied to the device’s X, Y, and Z axes. This is a subclass of Accelerometer, and measures acceleration applied to the device excluding the acceleration contributed by gravity. It uses x, y, and z properties as above. Another subclass of Accelerometer. This time the data represents acceleration due to the effect of gravity on each of the devices axes. (Note that this sensor is not currently available in Chrome). Next, let’s look at the Ambient Light Sensor. This sensor reports the environmental light level as detected by the device’s light sensor. Use cases could include accessibility, smart lighting, and camera settings based on ambient light. Note that at the time of writing, environmental sensors (the Ambient Light Sensor, and Magnetometer) must be manually enabled in Chrome browser by visiting chrome://flags and enabling the Generic Sensor Extra Classes option, so do this first before trying to run any demo code. The Ambient light sensor reports the detected light level in lux units, between 0 and around 30000 (the upper limit appears to be device-dependent: some devices tested maxed out at 32768, while others at 30000). Now let’s do something else with the data, apart from just outputting the raw values to the browser. A use-case for the ambient light sensor could be to automatically adjust screen brightness based on the ambient light. When the environment is bright, we crank up the screen brightness; when it’s dark, then we crank it down. However, the web browser can’t control the actual raw screen levels. One thing we can do however is adjust the colours on the page to show darker or lighter colours based on the ambient light readings, so we could have a dark theme and a light theme. An alternative example, and perhaps more useful, could be to toggle a CSS class, light, or dark whenever the light level crosses some threshold. There are limitations to this approach though, as outlined in the Magnetometer interface description. The main problem is that the device needs to be level with the Earth’s surface, or else tilt compensation should be applied. We can improve on this using the Orientation sensor, which is a fusion sensor combining accelerometer, magnetometer, and gyroscope data. We briefly mentioned fusion sensors earlier, and how they are a benefit of the Generic Sensor API. By combining data from multiple real sensors, new virtual sensors can be implemented that combine and filter the data so that it’s easier to use, or so that it can be more useful in a particular problem domain. We can see this by improving on our initial Magnetometer compass example with the OrientationSensor. Each rotation data event from these sensors is returned as a quaternion [x,y,z,w] that represents a rotation in 3D space relative to the coordinate system. The components representing the vector part of the quaternion go first, and the scalar component comes after. Returning data in this format makes more compatible with graphics environments such as WebGL. A real benefit of using quaternion data can be seen through 3D examples with WebGL, or third party 3D libraries such as Three.js. We won’t go into these here, but there are several excellent examples on Intel’s Generic Sensor API Demos github project that demonstrate some of the possibilities, including 360 degree panorama and VR demos. I recommend checking these out. 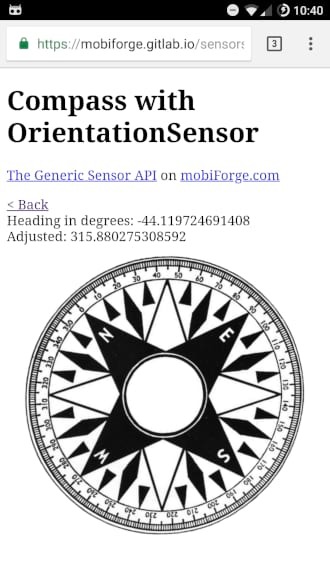 We’ll update our previous compass example to make use of the OrientationSensor. Since we’re concerned with the orientation of the device with respect to the real world, this sounds like a job for AbsoluteOrientationSensor. As before, we’ll multiply by 180/Math.PI to convert from radians to degrees, and now we have a heading. The rest of the example code is the same as before. The advantage of the fusion sensor can be seen in this example: the compass is more stable, and not affected by tilting. There is a request for implementation of a Geolocation Sensor for the Generic Sensor API, but at time of writing no such sensor has been implemented in any of the main browsers. Notably, there has been a discussion on the merits of high-level vs low-level access to underlying sensors. The Generic Sensor API is integrated with the Permissions API. However, the spec states that access can be granted without prompting the user, and it depends on the browser and the sensor in question. While access to accelerometer and gyro sensors might not seem as important to require permission for, as, say a Geolocation sensor, there can be unforeseen and undesirable uses of seemingly innocuous sensors. Felix Krause, a developer at Google, demonstrated a proof of concept of how a user’s activity can be determined based on the data coming from acceleration and gyro sensors, using the older APIs. According to Felix, it would likely be possible to determine if a user was impaired due to alcohol too! The Generic Sensor API team were quick to point out that security and privacy were central considerations in the API, intimating that this should not be possible with the Generic Sensor API. In the current Chrome implementation anyway, user permission was not required to access any of the sensors used in this article, so it looks like it might still be possible to reproduce this tracking behaviour in the new API. On the other hand, it’s worth noting that sensor readings will only be available for active and visible pages. This should reduce somewhat the tracking risks described above in some circumstances, for example, when the device is in a pocket, but not while the user is actively using the device. A discussion about sensor permissions can be found here. Generic Sensor API: a grand-unifying sensor API? 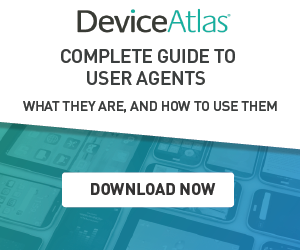 At the outset of this article, we mentioned that the goal of the API was to provide a consistent interface to all device sensors. It’s early days still. Browser support is minimal. Apart from the AmbientLightSensor, Chrome is the only browser offering support right now. Of the sensors supported in Chrome 67, the API delivers a good developer experience, delivering on its promise to provide a consistent API across different sensors. A notable sensor absent right now is the Geolocation sensor. Although the HTML5 Geolocation API already provides location data (derived from GPS, A-GPS, Wifi data) to the browser, it seems like a likely candidate for the Generic Sensor API. 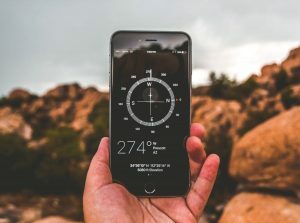 Geolocation is a key part of the modern mobile experience, covering everything from navigation to local search, and was the first sensor I thought of when I first heard about the Generic Sensor API. While work is underway, its specification is only at Editor’s draft status, and not an actual recommendation like the other sensors discussed in this article. The Generic Sensor API provides a nice, consistent interface to device sensors but needs to include Geolocation before it can be considered complete.